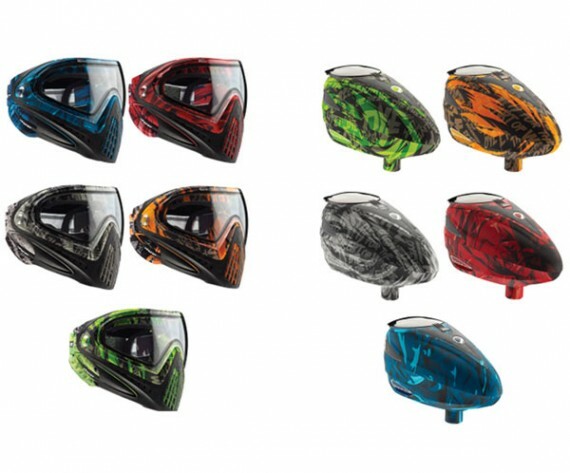 SKU: SKU22500 Categories: Dye & Proto Goggles, Specials Brands: Dye. Email us at [email protected] for color availablility! Dye Blows the competition away with the new Dye Rotor Paintball Loader. REVOLUTIONARY PATENTED ROTOR™ TECHNOLOGY – The ROTOR™ LOADER far exceeds pro level feed requirements with an impressive 50+ balls per second feed rate. The constant feed rotor carousel combined with the opposing rotation of the center rotor arm provides smooth, consistent, rapid and dependable feed performance shot after shot. This new technological design provides unmatched performance over any other loader on the market. LOW PROFILE – Designed with the professional player in mind, the unique center feed design of the Rotor™ pushes balls straight down over a short distance allowing the loader size and shape to be small and low profile. 200 BALL CAPACITY – Play longer without reloading. The ROTOR™ holds up to 20% more paint than most loaders, while having the lowest profile. Additionally, the ROTOR™ is also the lightest 200 round loader available. Simply smaller, lighter and faster. SPRING LOADED FLOOR TRAY – The Patent Pending revolutionary collapsing floor tray allows for maximum ball capacity, while ensuring consistent, reliable feeding down to the last ball. The spring floor tray also ensures ball feeding while shooting at elevated targets by raising the floor as you shoot. NO TOOLS NEEDED – The ROTOR™ can be effortlessly broken down for basic cleaning or maintenance with the push of a button. No tiny screws and nuts to loosen, parts to lose or break off. Just smart and simple engineering with the players needs in mind. SEE THROUGH WINDOW – Provides you the ability to monitor your paint level visually so you don’t get caught without paint. Windows available in additional colors (sold separately). INTERCHANGEABLE CARRIER WITH SPRING LID – The transparent locking lid is integrated into an interchangeable dual density carrier. The spring tension lid allows fast loading and a secure lock on the loader. The carrier design allows you to quickly change between your lid or speed feed. Additionally the removable upper shell allows you to use a high capacity upper that will hold 250 rounds (sold separately). POSITIVE PUSH POWER BUTTON – Single push Power On/Off button with LED display. The positive push button and bright LED informs you when your loader is on or off. JAM RELEASE TRIGGER – In the rare event of a ball jam caused by oversized or out of round paint, simply give the jam release trigger a quick pull and you are back in action. SHOT COUNT – The ROTOR™ provides an impressive 50,000+ ball shot count on one set of three AA batteries. This new design of efficient power regulation is revolutionary and the first of its kind in loader technology. Dye Precision I4. This is the greatest paintball mask to ever hit the market. This will keep you in the game longer! This Goggle offers more vertical and horizontal peripheral vision than any other mask system on the market today. Clear unobstructed vision both up and down allows you to clearly see all of the field details without constantly moving your head. Movement is much easier to recognize and provides a clear visual advantage. This is also combined with our optically correct tirodial impact lens that provides optical clarity and sharpness while protecting your eyes. The sleek, light, low profile soft compression ear pads provide the protection you need while offering style and hearing clarity. Ear protection is important and the i4 provides it while not being obstructive, bulky or heavy. Additionally, the ear pieces are backed with a Cool Max® liner that wicks sweat away while providing comfort and keeping your ears cool. This anatomically correct mask system offers the best in comfort for all facial contours. Designed with the ultimate comfort in mind, the i4 mask is the latest in anatomical facial fit and is supported by its lightweight construction. It was also tested at twice the current impact ASTM standards. It was built for comfort and built to last. The retention strap system needs to be adjusted once and once only. This sure lock feature is made possible by the woven rubber that is in the strap material itself. Unlike silicone that eventually breaks down and peels off, the elasticity of our rubber straps will out last the competition. The i4 is designed to fit your head and stay that way. One of the i4’s greatest features is the Multi-Directional Venting. Utilizing precise blade angling and a proven venting configuration, the i4 Multi-Directional Venting will make communication with your teammates effortless. This unique patented design drastically reduces re-ventilated fogging and will throw your voice farther and clearer than any other vented mask on the field. Now one of the lightest goggles on the market In professional paintball, lightweight is crucial to performance. The less your equipment weighs, the better you can perform and focus on the game. We’ve reduced the overall weight by 20%, giving you every possible edge. The i4 comes equipped with the enhanced High Definition Lens, providing optimal lens clarity in any weather situation. The high contrast tint greatly increases your visual perception and helps with distinguishing various colors on the field. The scratch resistant coating protects both sides of the lens against scratches and minor abrasions. The High Definition Lens has a unique UV protective coating, offering you exceptional UV protection. In the sport of paintball, optimizing your vision to the targeted environment is critical; our Lens helps you achieve that clarity.